Our founder has conceptualised, developed and trialed a model called “Waste It’s Mine – It’s Yours”. This unique participative social engagement model has seen residents in flats and staff in businesses divert significant amounts of waste from landfill and has earned her numerous nominations and finalist for awards, the most recent receiving the The Gatwick Green Diamond Green Champion of the Year (2011) award. "Anthea receives the prestigious Gatwick Diamond Green Champion award from Sir Trevor McDonald (left). Trish Breach of Search UK, and Jeremy Taylor, CEO Gatwick Diamond Business Association". Judges statement: ‘All three finalists for this award have an impressive knowledge and passion for the environment. However, the winner’s enthusiasm shone through, being infectious and truly inspirational, demonstrated by their ability to get even the most sceptical people involved with their waste reduction project. Not only did they strive to make a difference in their local community, overcoming many challenges in their path, but they have gone on to expand their project to involve local businesses too. 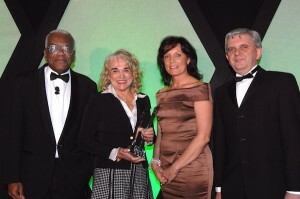 The Green Champion of the Year is enabling change in an inclusive, fun, educational and innovative way.’Winner’s statement: “I am honoured to receive this prestigious award and excited by the promise this recognition holds for the future of waste management in the Gatwick Diamond area and beyond. ARA engages business and residents to manage their waste where they work and live. As a team we thus divert a significant amount of waste from landfill and incur cost -and environmental savings. You need the people to make it work. It is the key to sustainability”. Anthea Rossouw, ARA. We have had the privilege of working with Anthea Rossouw of ARA for well over a year. Her dedication and commitment is of the highest standard. Her drive has made that all importance difference to our tenants lives. She conceptualized and blazed a new trail for recycling and communal composting of food at Walstead Court in Crawley. This model paved the way for subsequent implementation at our other courts, saving much waste from landfill and enthusing the residents to become involved. We have found Anthea to operate with a natural talent for understanding the human element, her ethical approach to day to day business issues is a model for us all. We are fully committed to the current partnership with Anthea from ARA, to empower our staff and tenants with the skills and knowledge to manage and recycle their waste where they live. We will try and ensure that we match Anthea’s drive, enthusiasm and energy for sustainability in and self improvement challenges. The founder, of ARA-UK, Anthea Rossouw, has the organisational and creative skills to innnovate and be a pioneer. To initiate and lead projects in hard-to-reach communities is her special forte as she loves to work with people who soon learn to rever her and follow her example of eternal optimism.. ARA-UK, as is Dreamcatcher, founded by Ms Rossouw, get buy-in; not as intervention, but rather as development with people. Not a ‘quick fix”, but as an initiative that is carefully monitored and mentored well beyond its inception to sustainability. Many women and children in South Africa have been liberated from poverty to a sustainable living because of Anthea. The impact of waste on health and the environment of the communities where she has worked, has inspired her to address it at the heart of sustainability: with the people themselves both in South Africa and the United Kingdom. She respected and loved in communities, yet she remains grounded and humble. I have experienced this first hand on visits. It’s a rare thing”. 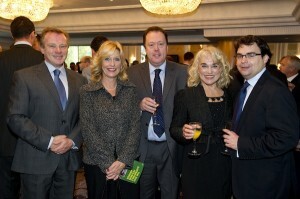 "Anthea + ARA were announced finalists at the Sustainable Housing awards 2010. Photographed at the ceremony where left to right: Mark Allum, Housing21, Cheryl Richards, Paul Richards, Housing 21, Anthea and Dr Ryan Woodard, University of Brighton". Anthea Roussouw worked with East Sussex County Council in the capacity of consultant on the externally funded ’Composting in the Community Project’ between October 2010 and March 2011. Anthea provided mentoring to two ESCC Compost Doctors relating to the implementation and delivery of a community based project in Hastings and Eastbourne. She shared her skills and knowledge relating to composting projects that she had designed in the past, delivered interactive educational workshops and managed the organisation of this aspect of the project. She also worked to obtain vital Environment Agency exemptions and liaised with project partners to ensure the smooth running of the pilot. Anthea’s excellent partnership working ensured the successful delivery of the project and her advice and support to the compost doctors were invaluable. This is an excellent recycling and composting project which has been developed by Anthea Rossouw. ! We are so elated to implement it and so further reduce our waste to landfill at Virgin Holidays”.